At this time of year, delicious al fresco meals with loved ones are at the top of our to do lists. We took the humble tomato and turned this simple, everyday ingredient into something so tasty that it is sure to become a family favourite. 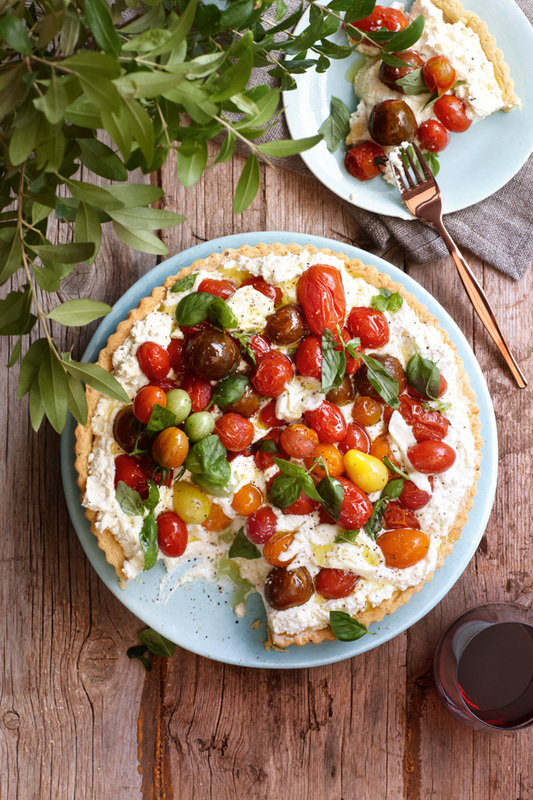 This summer inspired vegetarian tart is layered with ricotta and heirloom tomatoes, making it perfect for a light summer dinner or picnic. 1. Place all the pastry ingredients except the egg in a food processor and pulse until the mixture resembles breadcrumbs. 2. Add the egg and process until the dough just comes together. Don’t overwork it. 3. Shape the dough into a ball, wrap in cling film and refrigerate for 1 hour. 4. Preheat the oven to 180 °C and lightly grease a 24 cm tart pan. 5. Roll out the pastry between 2 sheets of baking paper until it’s about 4 mm thick. Remove the top sheet, flip the pastry into the pan and remove the remaining layer of paper. 6. Press the pastry down into the base and up the sides of the pan and discard excess pastry. 7. Prick the base all over with a fork and place back in the fridge for 15 minutes to firm up. 8. Bake blind for 15 to 20 minutes or until golden brown and crisp. Remove from the oven and leave the tart shell to cool completely. 9. In the meantime, toss the tomatoes, olive oil and sugar together and roast in the oven for 20 minutes or until the tomatoes are soft and caramelised. Set aside to cool. 10. Mix ricotta, goat’s cheese, cream cheese and cream together. Add the lemon zest and season to taste. 11. Spread the cheese mixture into the tart shell and scatter over pieces of torn mozzarella. Pile on the roasted tomatoes and garnish with lots of fresh basil leaves. Gather around the table and take it easy while enjoying this simple yet satisfying meal, paired with a fresh summer salad.